A Bruynzeel mobile archive shelving system is now available. This mobile shelving system is designed to let you get the most out of your workspace by enabling you to maximise the use of your floorspace. Maintaining accessibility and maximising storage capacity go hand in hand when setting up an archive. By choosing the Bruynzeel mobile archive shelving, every cubic centimetre of archive storage can be used efficiently with all your important documents at your fingertips. Unlike traditional shelving these mobile shelving units let you use all of your available space for storage as they only require one aisle to access all of the storage area. 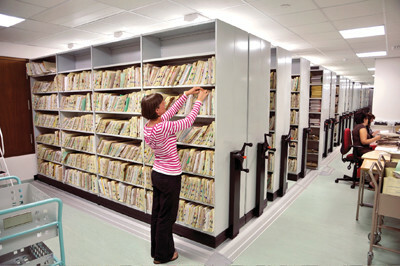 The mobile shelving simply moves to create an aisle where you can locate your documents. We can install bespoke solutions which can work around door openings and restricted height ceilings. Excellent condition available as a mobile system or static shelving excluding base unit. Plyboard shelf with metal frames. Surface mounted. For all enquiries please contact us direct or complete the form below.